I found myself in the East Pasadena area during lunch so I happenned upon Fu-Shing, a Chinese Szechwan restaurant. I was surprised how packed it was for lunch after 1:30pm and I actually had to wait. At first I was thinking of taking off and trying something else, but I'm glad I stuck around. The waiting area was full of past food reviews and I happened to see that Jonathan Gold actually did a CounterIntelligence article years ago. I was ignorant of the restaurants history so this was interesting. Apparently, this was a good Szechwan restaurant in San Gabriel, which had relocated. I was by myself, so I just got a lunch special (under $10 meal). 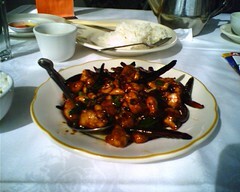 I figured I would start off with a standard Kung Pao Chicken dish. 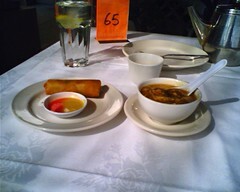 The lunch special started off with typical eggroll and hot & sour soup as pictured above. Nothing to write home about. 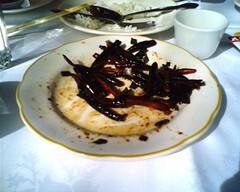 But the Kung Pao chicken was pretty good. A pile of smoky, peanutty chicken bits that was not drowned in sauce. What was cool was that this place doesn't shy away from the peppers! Check out what was left after I spooned away all the chicken, peanuts and veggies. I have to agree with Mr. Gold's assessment in his review, you really need to come with 4+ people so you can try a bunch of dishes here. If you're solo, come for a lunch. I'm going to come back with some more folks next time to try other dishes. I was trying to figure out which establishment would be the subject of my first post, but luckily the Colorado Wine Company was having their First Year Birthday bash on February 18th. The place was packed! A live DJ, some cheese, some sandwiches, and plenty of wine. Everyone was imbibing, smiling, and socializing. People with purple teeth chatted the night away about tanins and licorice & dark chocolate flavors...etc. I enjoyed a glass of these wines: Villa Wolf Pinot Gris (2004), Proyecto 4 (Spain 2000), and Leyda Reserve (Napa, CA 2003). Colorado Wine Company is a great addition to the Eagle Rock area. It's a low key, non-intimidating wine shop that has wines of excellent taste and value. John and Jen, the newlywed couple who runs the shop are super-friendly. They have a cozy wine tasting bar at the back of the store where you can taste wine by the glass most nights. 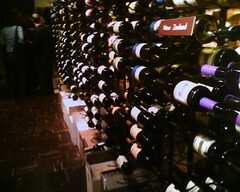 You won't find a huge selection of the expensive top wines of the world here. What you will find are wines of good value. I'm not a wine connoisseur, nor do I intend to become a sommelier. But I do enjoy learning more about wine when I can, and love a good meal paired with a good wine. And I enjoy sharing a good find with friends. Even with more information about wine readily available on the Internet, I still find it information overload. So it's nice to have a comfortable friendly place to go that can act as my filter and gives me a chance to experience a lot of different wines.